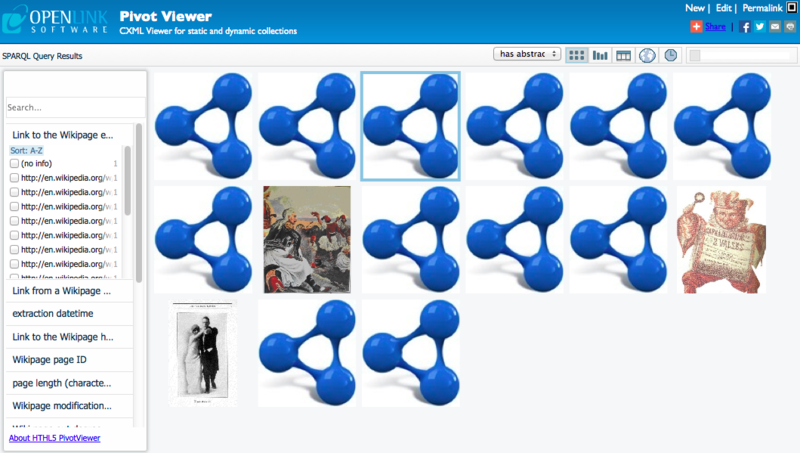 Using HtmlPivotViewer to View Results from Facet Browsing. 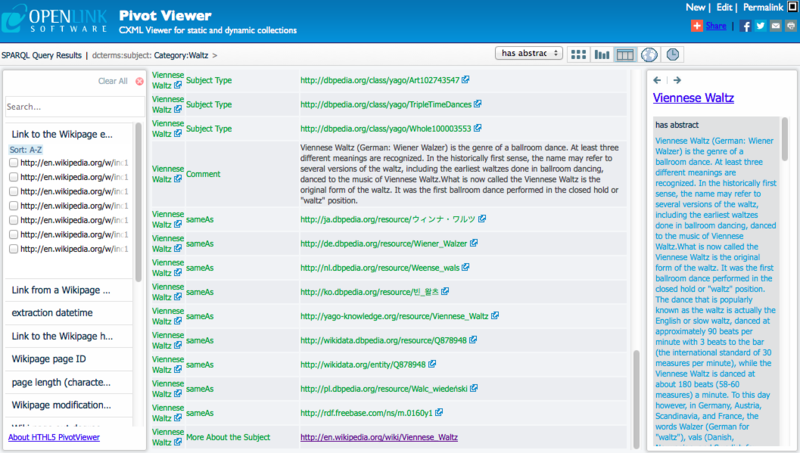 The Faceted Browser, usually the /fct endpoint on a Virtuoso Server, can be used to search and explore linked data triples held in Virtuoso (see example). HtmlPivotViewer is a data visualisation tool that is integrated into the Virtuoso faceted browser to give a alternative method of visualising and manipulating the data. 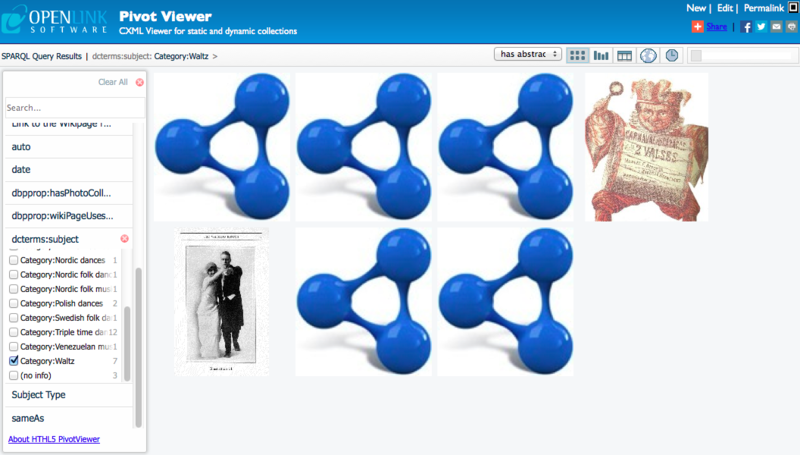 A typical use case would be to search using the facet browser and to coarsely filter the results to get a collection containing a manageable number of entities. This collection can then be displayed in HtmlPivotViewer? for further filtering and manipulation. Supposing I am interested in finding out about different variations of the waltz ballroom dance I might start by entering 'waltz' into the search box. 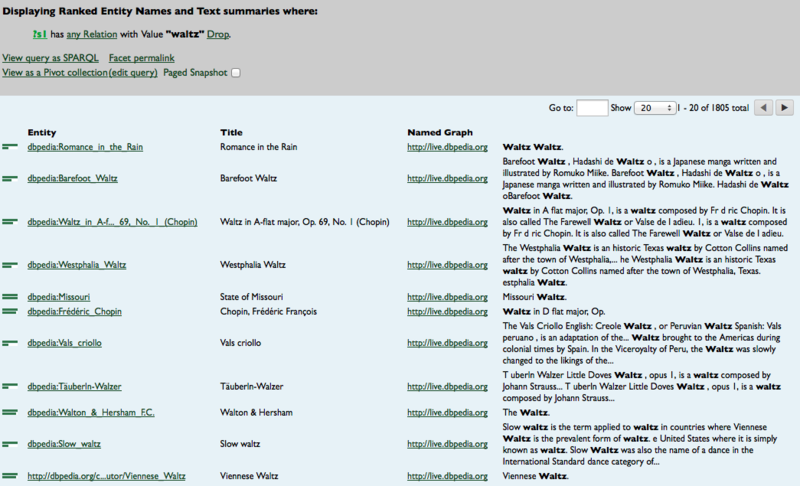 A simple free text search of the string waltz returns around 1800 results. Many of those results are not specifically about the dance the waltz. For example the results contains several pieces of music with the word waltz in the title. 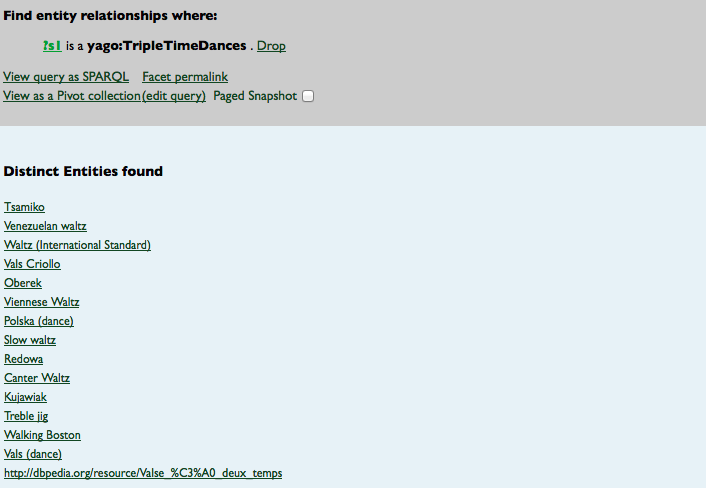 However, in the list of results I can see an entity called the dbpedia:slow_waltz. If I click on this link I get a description of the dbpedia:slow_waltz that shows it is an entity with a type http://dbpedia.org/class/yago/TripleTimeDances. Selecting yago:TripleTimeDances takes me to a page that describes that entity type. From here I have the option to start a new facet based on this entity type. I will get results that are all triple time dances including a number of different types of waltz. If I now select View as a Pivot Collection I can use HtmlPivotViewer to visualise and further explore the results collection. Results in HtmlPivotViewer. 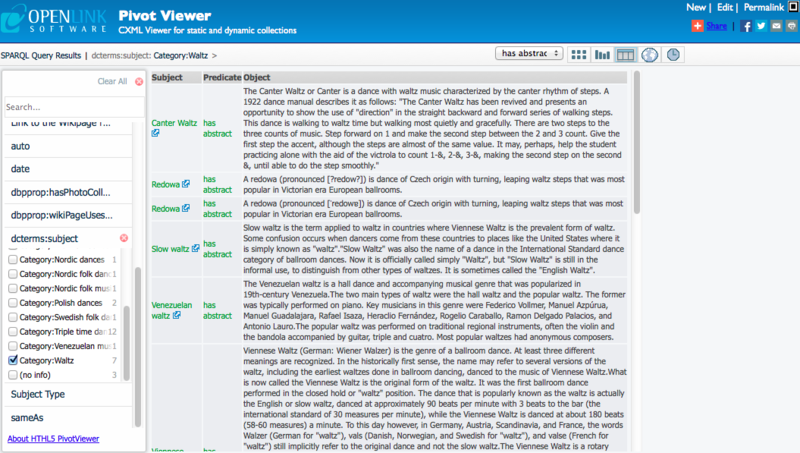 If I then decide I am interested in finding out more about one particular dance for example the Viennese Waltz I can select that item and clear the selected predicate to show all the information about the selected item. I can also follow the More About the Subject link to take me to the Wikipedia page that was the original source of the linked data in dbpedia-live.